FORT LAUDERDALE, Fla. (AP) - More than 26 tons of cocaine worth at least $715 million was brought ashore Thursday in Florida following multiple recent seizures by the U.S. Coast Guard and the Royal Canadian Navy in the eastern Pacific. 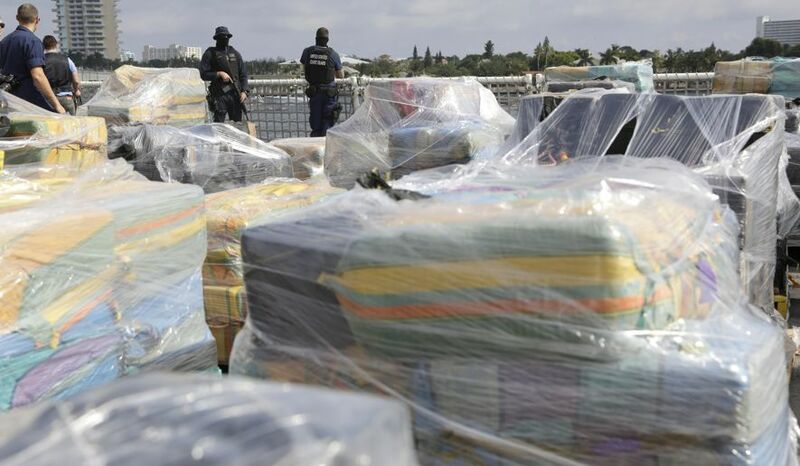 Coast Guard officers said at a news conference Thursday that the drugs brought to Fort Lauderdale came from 27 separate vessel interdictions and five bale recovery operations off Central and South America over the past three months. Pallets containing the drugs, many wrapped in brightly colored plastic and some bearing labels such as “white sugar” or “pork,” covered the entire flight deck of the 418-foot Coast Guard Cutter Hamilton. Vice Admiral Karl Schultz, Coast Guard commander in the Atlantic, said the seizures are part of an effort to target vessels bringing cocaine north by sea from Colombia, Peru and Bolivia before the loads reach land and are divided up into much smaller amounts for smuggling into the U.S. and Canada. Cocaine seizures at sea result in three times more drugs intercepted than all U.S. land-based law enforcement efforts combined, Shultz added. Authorities say about 100 suspected smugglers were detained in the various interdictions. Some are being prosecuted in South Florida, one reason the Hamilton brought the cocaine to Port Everglades. The Hamilton, a national security cutter, is based in Charleston, South Carolina. Commodore Craig Baines, commander of the Royal Canadian Naval Atlantic Fleet, said two British Columbia-based vessels were responsible for seizing more than 3,000 pounds of the cocaine offloaded Thursday as part of the joint operations. “It is a tangible example of our collective efforts to keep narcotics off our streets while at the same time promoting regional security,” Baines said. In the federal fiscal year that ended Sept. 30, Schultz said similar operations at sea resulted in the seizure of more than 221 tons of cocaine and numerous arrests. The cocaine brought ashore Thursday represents 75 percent of the drugs seized so far this fiscal year, he said. Hamilton Capt. Scott Clendenin said the smugglers are constantly changing tactics, such as using submarine-like vessels that operate just beneath the waves. He said the Hamilton has the most updated surveillance and tracking equipment available, giving the Coast Guard a better chance of catching the smugglers even at night. “It’s a very difficult operating environment. They have an advantage but we are taking over that advantage,” Clendenin said. The seized cocaine typically is kept in a secure location as evidence for criminal prosecutions and is eventually burned by the Drug Enforcement Administration, officials said. Copy and paste from the Washington Post.